While there are a million plotlines and hundreds of explanations of how various superheroes got their special powers, there was one superhero in the 1960s who maintained his powers to fight evil by lighting up. 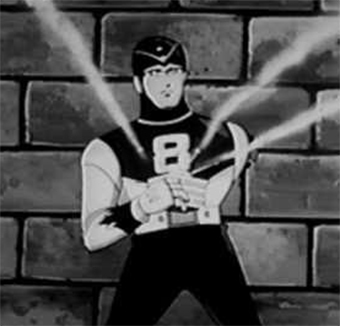 “8-Man” originally ran as a weekly comic strip in Japan from 1960 to 1963, then a half-hour cartoon from 1963 to 1964. The show eventually moved overseas to air on American television as well, starting in 1965. The U.S. version had a few changes to suit American tastes, was re-edited, dubbed into English, and renamed The Eighth Man. Eighth Man centered on a police detective, Peter Brady (Detective Yokoda in the Japanese version), who was killed. After his death, in true comic book style, Brady’s body was claimed by- who else? – a scientist. The scientist’s name was “Professor Genius” (Professor Tani in the Japanese version) who experimented on the body. While he’d tried it seven times before Brady and failed, Genius’ experiment to bring Brady back to life worked… sort of. He was able to successfully transfer Brady’s life essence into an android with amazing abilities. While it’s commonly accepted today that you can’t run, jump, fly, fight crime and perform other amazing feats if you’re a heavy smoker, during 8-Man’s time, smoking was the key to his powers. Just as Popeye downed a can of spinach when he needed strength, 8-Man would recharge his “atomic energy supply” with a substance manufactured in a laboratory and put in rolled papers, very much resembling cigarettes; a few puffs on his special smokes and 8-Man was revitalized and ready to take on the evildoers of the world. 8-Man wasn’t the only superhero to have a questionable power source in that era. “Super Chicken” was another who transformed from his alter ego, Cabot Henhouse III, after drinking “Souper Sauce”. (Booze anyone?) Underdog also seemingly had an addiction problem, getting his powers from popping pills. Some later superheroes also had unusual or just downright weird powers. Many never made it to fame because their powers were a little too different. For instance, Marvel Comic’s “Squirrel Girl” was a high school student who could control squirrels and used them to fight villains. She also had a 3-4 foot tail, buck teeth, claws (and retractable knuckle-spikes a-la Wolverine), and lips that tasted like hazelnuts… She wanted desperately to be Iron Man’s sidekick, but he rejected her, even after she saved his life- though he did tell her when she was older, perhaps she could join the Avengers. The good news is that Zeitgeist now realized he had a super power and began using it for good by vomiting all over the bad guys. His stomach acid was so potent, that it could burn through a 4 inch thick steel plate in half a minute. I’m just guessing with that on her face, the girl did not get her face back. In the American version, Brady in android form was renamed Tobor (“robot” spelled backward). “8-Man” is believed to be the inspiration for the RoboCop franchise, which came along many years later. In the American version of the show, “The Eighth Man” name comes from the fact that he’s the eighth try at making such a cyborg. In the Japanese series, the character is named that because there were seven official police precincts and 8-Man was considered by the rest of the squad to be an eighth, unofficial, crime-fighting precinct of his own. NICE COLLECTION OF ALL WEIRDOS IN ONE PLACE. SUPERCHAMP HU POWERS UP BY LIGHTING-UP….LOL. GUD ONE STACY. I remember 8th Man from when I was a tiny tyke. We used to “smoke” candy cigarettes (yep, they had them then) when we played 8th Man on the playground. Lucky for me, I never became a smoker (although I am a crime fighting Japanese robot). Also, Squirrel Girl is undergoing a renaissance. She’s become a popular meme http://knowyourmeme.com/photos/911180-marvel-comics and now even has her own comic. There was also an underground comic in which a superman ripoff character,”Captain Gutz”, got his powers from drinking a ton of beer, and a “Too Much Coffee Man!” character, who got strong from drinking pots of super strong expressos, and even a “Captain Cannabis” superhero who got superman like powers from smoking enormous marijuana blunts! I remember 8th man I am just suprsized hardly anyone else in my age group does. My brother swears up and down to never watching him and I remember him in the livingroom with me watching the cartoon.